I found a cool way around my dilemma. 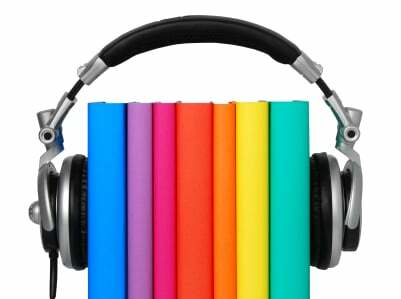 Audio books. I noticed that many times I am busy performing a task (e.g., cooking, exercising, traveling, commuting) but my ears and my mind are still available to process information. This is where audio books come in. I tried it a while ago and I loved it. I can go through a few books a month and catch up on my “reading”. Yes, this is something we can do on the iPad and iPad mini as well as on other iOS devices such as iPhone and iPod touch. Would you like to listen to 1 audio book for the next month for free? Make sure you are connected to the Internet before you continue. Because Audible is an Amazon company, you can sign up with your existing Amazon account. Remember that the trial is free for only the first 30 days.You may want to mark this on your iPad calendar. Once you start your trial, you will be given 1 credit to download an audio book. 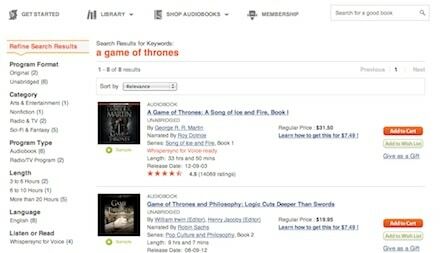 Search for an audio book of your liking and add it to your cart. You can apply the 1 credit towards downloading this audio book. When you get an audio book you can to listen to it on your iPad or other iOS devices (iPhone, iPod touch) using the Audible App. Now we need to download the free Audible App from the App Store. Have a look at this post if you need to refresh how to download and install iPad Apps. Make sure you search for “Audible” on the App store. Tap on the Audible icon to start the App. 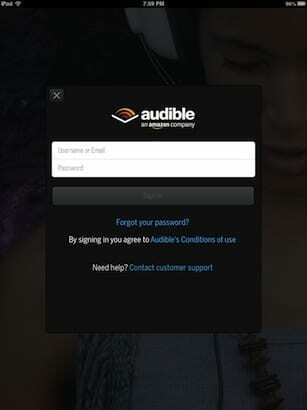 Login using your Audible account. 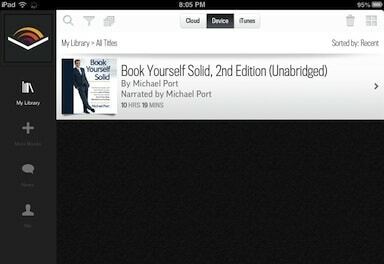 On the main Audible App screen, under “My Library”, you have 3 buttons or tabs: Cloud, Device, iTunes. Tapping on Cloud will display the book(s) you acquired in the previous step. Tap on the book title to download it to your iPad. Once the download is done, tap on the book cover to begin playing. If you liked this post please leave a comment below and share it with your friends.